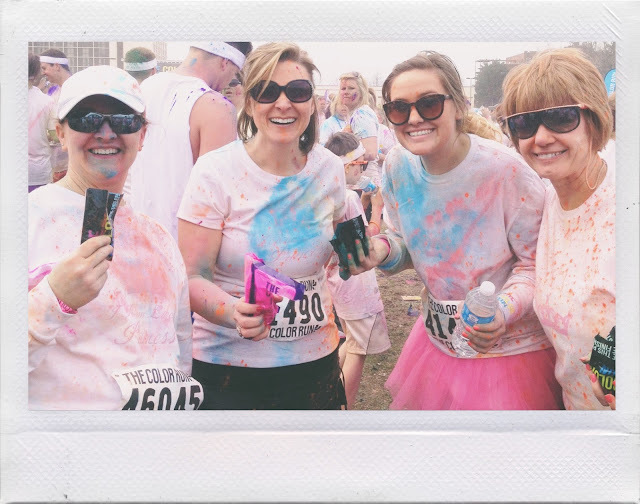 It all started with my good pal Janel doing Color Run in St. Louis last year. Then I became obsessed. I did all this research on it, and found out everything I could... I couldn't wait until the next year when Color Run would come around again! 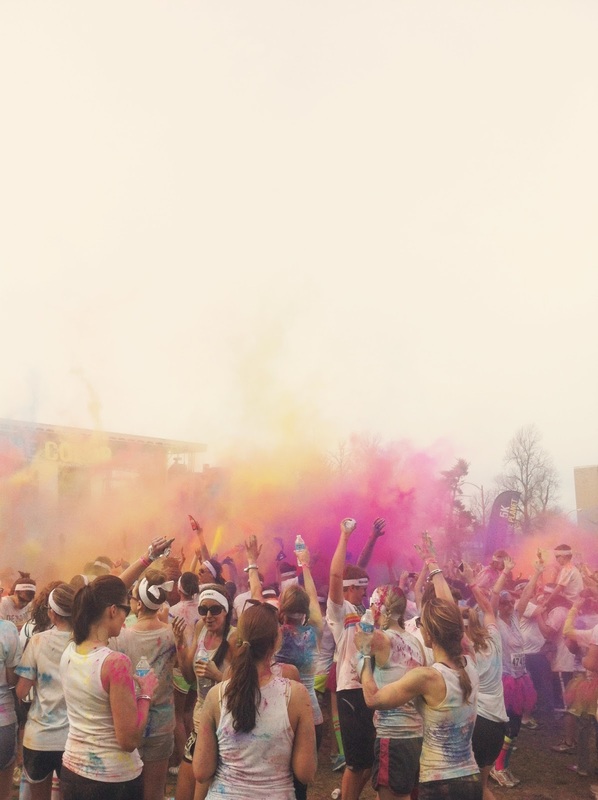 And then... oh, and then it popped up in my email that Color Run was making it's way to Springfield. After texting everyone I knew, I patiently waited for registration to open. 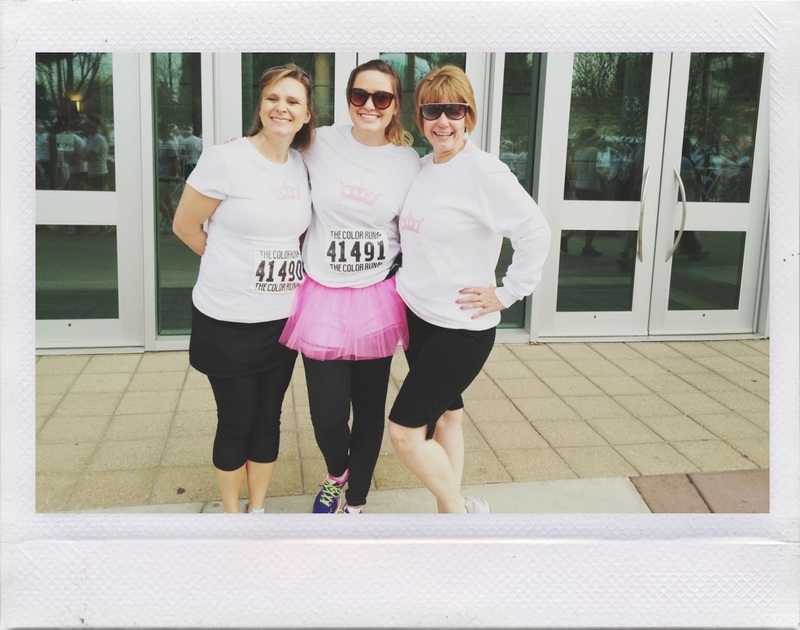 So, the 5k was this past weekend and it was a BLAST. I am not a runner by any stretch of the imagination, but I had so much fun. I'm signed up for Color Me Rad (basically the same thing as Color Run) at the end of the month, and it can't get here fast enough! It was rather awkward walking (...er, running...) up to the color stations. Every kilometer, there was a new station with a different color that is just thrown on you. Walking up to it, all you see is a big dust cloud of color. At the first one, which was yellow, I was like, "do I breathe when I go through?!" By the time I got to the last color station I was spitting out color because I'd gotten some in my both. And Blake had blue snot for a few days. Ha! I hope you had a fantastic weekend, I sure did! (I got to try out Farmers Gastropub for the first time. Remind me again why I'd never been there before?! I do believe it is now on the consideration list for rehearsal dinner spots...) Blake and I also saw the new Evil Dead movie. YIKES. I'm such a sissy sometimes! I made it through alright, but I'll just say I prefer the original cheesy version better. This new one is too creepy for me! I'm big on horror films but I've gotten to the point where I can't do gore anymore! Hashtag sad face. I wanted to do this soooo badly, but my mom came into town for her birthday. I'm definitely doing it next year. It looks like a blast! This is so awesome! Someday I want to do a run like this!